Crown: Badly decayed or weakened teeth often require further treatment than normal fillings. Crowns or caps can strengthen such weakened teeth. 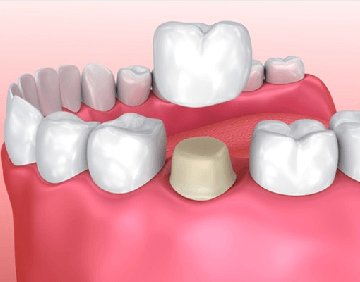 A crown is an artificial restoration that fits over and entirely covers up the remaining part of a prepared tooth, making it strong and giving it the shape of a natural tooth. Bridge: When one or more teeth are missing in the oral cavity, the remaining natural teeth tend to shift out of their normal position. These shifted teeth are often more difficult to clean as a result they are more susceptible to decay or gum diseases. Shifting of teeth will lead to changes in the bite, which often put stress on the teeth,muscles and jaw.Ultimately, the ability to chew comfortably may be affected.A fixed bridge can restore your teeth to normal functioning by replacing missing teeth. That helps improvethe entire health of your mouth by keeping the surrounding teeth in position, and can also help maintain the structure of your face and jaw.affected. 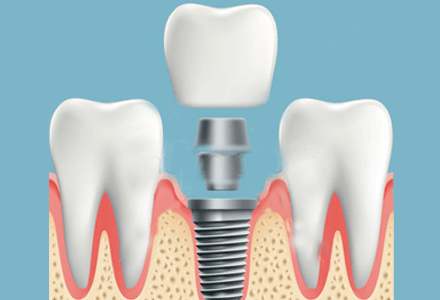 A fixed bridge can restore your teeth to normal functioning by replacing missing teeth. That helps improve the entire health of your mouth by keeping the surrounding teeth in position, and can also help maintain the structure of your face and jaw. In this era of cosmetic dentistry Crowns & Bridges made with Ceramic or Zirconia (Strongest) like tooth colored material, can be as pleasing aesthetically as they are functionally. Weakened or shifted teeth can cause decay and gum problems that lead to expensive treatments. Detecting these problems in initial period can make treatments easier. A crown is used to offer strength to weak or decayed teeth. Similarly, bridges restore shifted teeth to their normal functionality. However, it all comes down to the expertise of certified dentists. Trusted Dental Treatment With Crown And Bridges. Taking cosmetic dentistry to new heights, Shah’s Dental Serenity has every service that you are looking for. Our dental expertise includes crown and bridges treatment to offer strong teeth setting along with aesthetic beauty. A team of qualified doctors works to resolve your dental issues. We have been serving our clients for years now, so you can put your faith in us. Our status in the industry and satisfied patients show every piece of evidence regarding our expertise. We leave no chances of discomfort during or after the procedure. Hence, our dentistry experts leverage high-quality treatment techniques and technology to conduct every procedure with excellence. Our treatment plan includes medical, logical, financial and consultation point of views. This way, we work as a comprehensive team of dental care for you in Mumbai. If you are having trouble due to decaying or shifted teeth, don’t wait for long. Come to us and let our dentists help you out.